Book clubs, knitting clubs, Scrabble and craft groups are common sights in cafes, but what about people coming together to repair things? 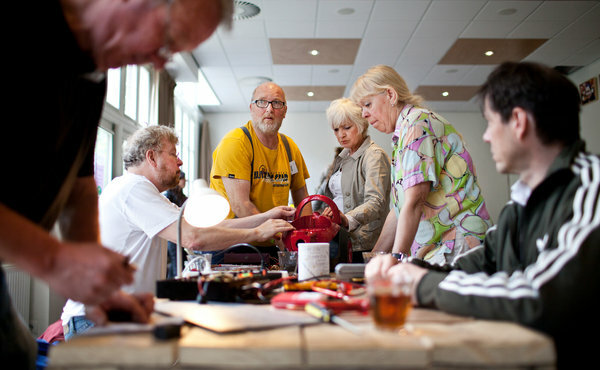 Originating in the Netherlands in 2009, ‘Repair Cafes’ are places where people can meet to repair broken items together, and they are free. The concept is simple: bring your broken item, meet people with skills and tools to help you fix it — whether a screwdriver or sewing machine. The concept is free, no money changes hands, and everyone involved is local (sometimes unemployed, so there is a social-engagement benefit too). If you don’t have anything that needs repairing, but want to drop in for a coffee, that is ok too. In a throw-away society where items are seemingly designed to break so we buy more — whether a toy, a button, or a lamp — this is one way to help stop the waste, learn new skills, share skills, and connect with others. As the story says, it is not just about repairing ‘stuff’, it is about repairing community because people who don’t normally speak to each other, are coming together. And there is a nice environmental spin-off too. I learnt about Repair Cafes thanks to a story on AlJazeera. You can read more about this great idea, and how to start one of your own, at the Repair Cafe website.